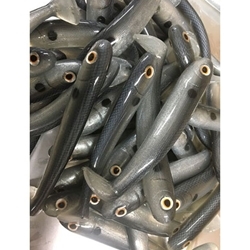 Hollow Body Swimbait that is usually reserved for our personal stash. This bait just flat out gets bit. Designed to have more body wiggle on the retrieve than your average hollow body and a solid head section to better hold a swimbait hook or a jighead. The 4.5" has long been a go to when fishing gets tough and we need a smaller profile weedless swimbait. Now available in several incredibly detailed airbrushed patterns.